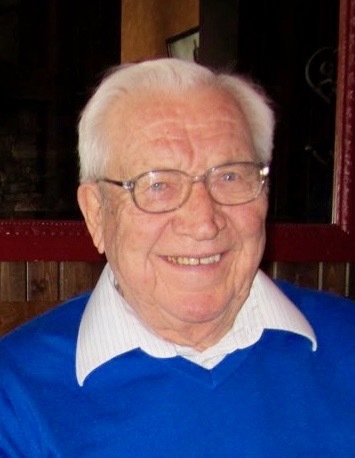 Earl William Bedard, 91, of Ironton, passed away peacefully on Monday, February 4, 2019, at the Cuyuna Regional Medical Center in Crosby, MN. He was surrounded by his loving family. Earl was born in Ironton on June 28, 1927, to William and Johanna Bedard. He graduated from Crosby-Ironton High School in 1945 and joined the war effort, for which he was stationed with the Navy in New Orleans.After the war, Earl returned home to attend Crosby-Ironton Junior College and begin a successful accounting career with the Hanna Mining Company. He met and married the love of his life, Evelyn Forrest, to whom he was married 66 years. They raised six children together and spent their lives devoted to one another – and their growing family. Throughout his lifetime, Earl enjoyed spending time with his family and friends, fishing on area lakes, hunting, golfing, and serving his community. Earl’s lifelong commitment to public service included 62 years as founding member of the Cuyuna Regional Medical Center board; 72 years as member of the Myrin-James American Legion Post 443; and lengthy tenures as mayor of Ironton, member of the Crosby-Ironton Public Schools Foundation, and volunteer with the local fire department. In addition, Earl was an active member of the Knights of Columbus and St Joseph’s Catholic Church in Crosby. Earl was preceded in death by his wife, Evelyn; his parents; his brother and sister-in-law, Fred and Josephine; his sister and brother-in-law, Blanche and LaValle Lund; and his brother-in-law Robert Melenich. Earl is survived by his six children, Rae Lynn (Paul) Schmit, Bill (Andrea) Bedard, Michele (Carl) Hendrickson, Thomas (Bobbie) Bedard, Cynthia (David) Owens, James (Shannon) Bedard; eleven grandchildren, Derek (Amy) Hendrickson, Matthew Schmit (Sarah Franz), Kali (Jason) Peik, Marcus (Jennifer) Schmit, Korie Bedard, Lisa Bedard, Adam (Misty) Bedard, Daniel Schmit, Aaron (Jodi) Bedard, Tanner Bedard, and Trevor Bedard; and his nine great-grandchildren, Treydn and Tysen Hendrickson, Jaden and Addison Peik, Eli and Clara Schmit, Luci Bedard, Mathis Bedard, and Colette Franz Schmit. He is also survived by two sisters, Jean Melenich and Joan (Wayne) Gutzman. Earl’s life will be celebrated with a Mass of Christian Burial at 11:00 a.m. on Saturday, February 9, 2019, at St Joseph’s Catholic Church in Crosby, MN. Burial will be at the Lakewood Cemetery in Crosby with full military honors given by Myrin-James American Legion Post #443, Ironton. Visitation will be held on Friday, February 8, from 4:00 to 7:00 p.m. with a rosary at 6:30 p.m. at Koop Funeral Home in Crosby, MN and one hour prior to the mass on Saturday at the church.